Have you ever wondered how seemingly small, every day decisions change the course of your life, and the lives of others? That is the primary question Laine Moriarty tackles in The Husband’s Secret. Through following the lives of three women- Cecilia- the Martha Stewart-esque perfectionist, Tess- the heartbroken, anxious mother, and Rachel- the grief laden retiree- we see how their personal struggles and tragedies affect and intertwine with each other, in both positive and negative ways. The Husband’s Secret is a compelling and entertaining read. Rarely can I “not put a book down”, but it was certainly the case this time. I appreciated the honesty with which Moriarty wrote the female characters, with their complex emotions and motivations. At times funny, irrational, tragic, and unsympathetic, the characters feel relatable in their best and worst moments. Although some of the subject matter is a bit dark, this is an entertaining read that kept me going from beginning to end, which says a lot for a woman who mostly reads books half way. 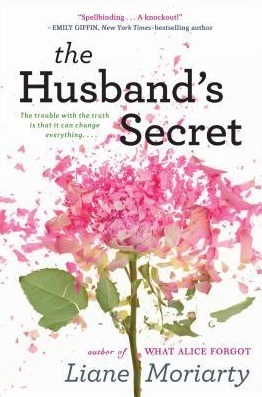 For an escapist read full of twists and turns, I highly recommend The Husband’s Secret.